Fisher-Price Bright Beats Dance & Move BeatBo Review – A great choice. Does Bright Beats Dance & Move BeatBo Really Work? Choosing the perfect gift for the youngsters in your life is no easy task. Mostly because they have so many things on their “want” list its hard to choose the one you want to give. The Fisher-Price Bright Beats Dance & Move BeatBo is one of the popular items this year for many of the little ones. It has all the components that draw the little one’s attention. It is brightly colored, soft and cuddly, and dances and moves much to the delight of its new little owners. The company claims that this Fisher-Price Bright Beats Dance & Move BeatBo is ideal for those kids between the ages of 9 months to 3 years. They are claiming it is a great way to help the little ones develop recognition and interact. The name Fisher – Price needs no introduction to most parents and they automatically assume that any toy created by this manufacturer is sure to delight the little ones. They can count on its quality and its ability to please. Being as the brand is so well known the Company really doesn’t have to create any hype. The price may vary slightly depending on where you buy the Fisher-Price Bright Beats Dance & Move BeatBo. You may be able to find it on sale but unlikely as this is a hot item this year. You can expect to pay around $39.99 for it and you should be able to get it at most major stores, unless they have sold out early. You are going to have as much fun introducing this toy to the little one, as the youngster is playing with it. 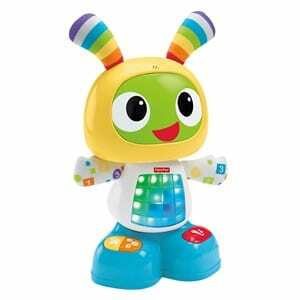 For the 9 month old you will probably have to interact with them to get the Fisher-Price Bright Beats Dance & Move BeatBo to go through all his antics. The older ones will master this themselves. The Fisher-Price Bright Beats Dance & Move BeatBo has a lot of good features to it. It has three different modes to it so that the little one doesn’t become bored easily. It has the dance and move mode,the learning and games mode, and then finally the sing along mode which you can customize. We are going to give the Fisher-Price Bright Beats Dance & Move BeatBo a Thumbs Up rating. We like the credibility of Fisher-Price and the price is reasonable for all that this toy can do. It allows for some great interaction between the parents and the little one. At the same time the child can spend hours entertaining themselves with all the activities that BeatBo has to offer. We encourage you to really interact with this toy and your little one at first so they really get to use all that the Fisher-Price Bright Beats Dance & Move BeatBo has to offer. It stimulates learning and movement so it is really an educational toy in its own class.Toys is a favorite subject of us because we feel they are so important to a child’s learning process. We have reviewed many different types like the Bright Buddies, for example. What do you think? Does Bright Beats Dance & Move BeatBo work or not? Does Wonder Forts Really Work? Does Wall Dazzle Really Work?